After a six week display in Falk Library, the NLM traveling exhibit, From DNA to Beer: Harnessing Nature in Medicine and Industry, came to a close on Saturday, October 10. Over 3,000 visitors viewed the panels and video display in the main study area of the library. In conjunction with the exhibit, Adam Davis gave a special lecture on Thursday, September 17, entitled “Background to the Discovery of DNA.” Davis recounted the early history of biologists and other scientists and their important, sometimes accidental, discoveries that built the foundation for the double-helix structure we are familiar with today. 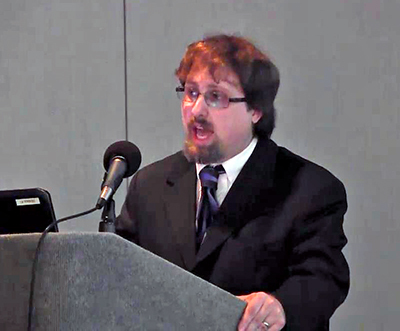 Davis earned his Master’s Degree in biological anthropology from the University of Pittsburgh. He currently teaches History of Science at Duquesne University and is associate professor of biology at the Community College of Allegheny County. Following the lecture, a reception was held in Falk Library for visitors to socialize, view the exhibit, and enjoy a few snacks. Guests feasted on Oktoberfest-themed refreshments, including root beer floats and a pretzel bar. A second lecture took place on Thursday, October 8, presented by the University of Pittsburgh’s Jamie Johnston. 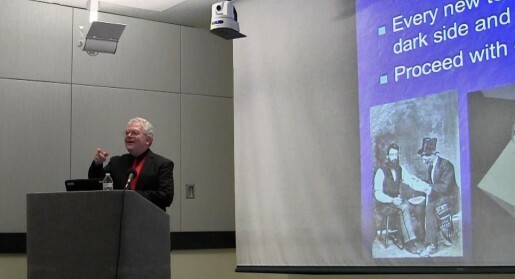 His lecture, “Erythropoietin: A Case History—The Promise and Perils of Harnessing Nature,” looked at the progress from bloodletting and transfusions, to the FDA approval of EPO—a success story with a dark side in industry and politics. Johnston is currently a professor in the Department of Medicine, director of the Renal Fellowship Program, clinical director of the Renal-Electrolyte Division, and director of the Academy of Master Educators. Both lectures were recorded and can be viewed on the HSLS YouTube Channel.